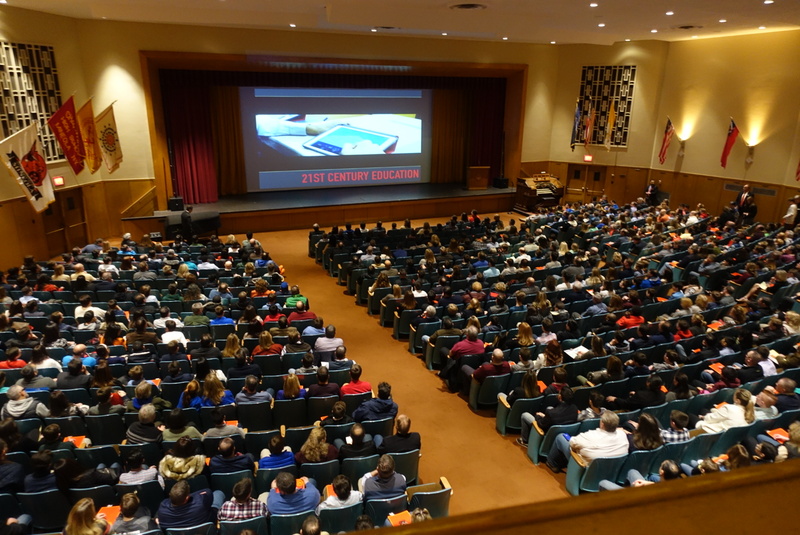 Chaminade held its annual open house for accepted students on Saturday, January 21, and at least one experienced observer thought it ranked among the best the school has hosted. The accepted candidates and their families view a presentation on the use of iPads at Chaminade. The open house is a two-way street of sorts: Chaminade gets a chance to showcase itself to the excellent students who have earned admission to the school, and the students receive an opportunity to tour the school and determine whether it is the right place for them. The event was broken into two sessions—morning and afternoon—with Bro. Thomas Cleary, S.M. ’81, and other school administrators giving presentations on academics, activities, transportation, athletics, and the new Science, Technology, and Research building. 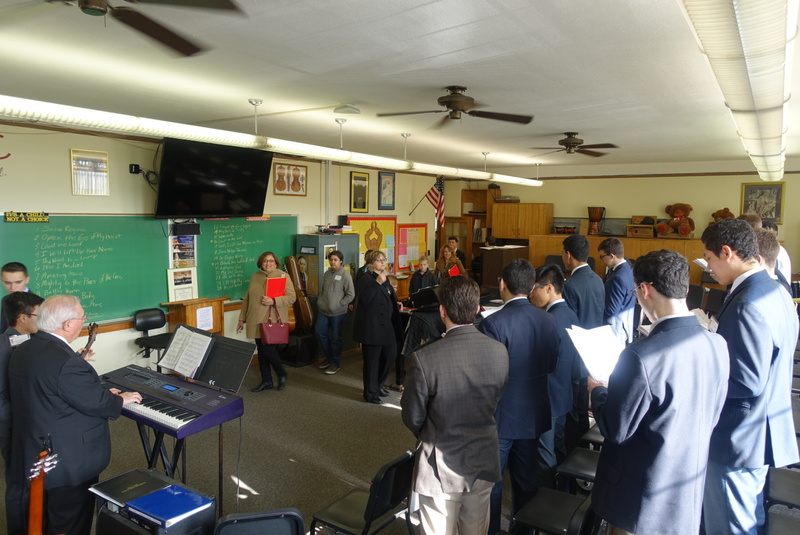 After the presentations, faculty members and students in the National Honor Society gave tours to the accepted students and their parents. 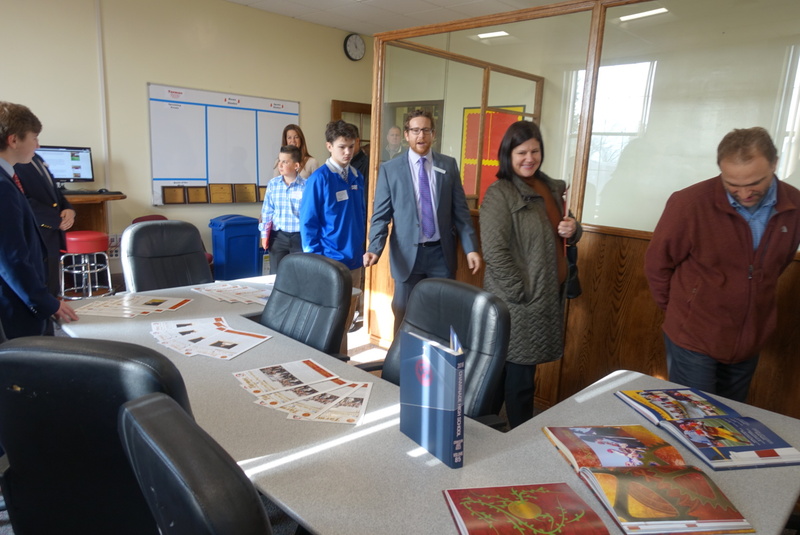 Mr. Matthew Chicavich ’98 guides a tour group through Chaminade’s Publications Center, home to Tarmac and Crimson and Gold. The tours, in particular, are the main highlight of the open house, because they give students a chance to experience the school firsthand. Knowing that they have already been accepted, the students can ask more specific questions to understand how they will fit in with the Chaminade family. 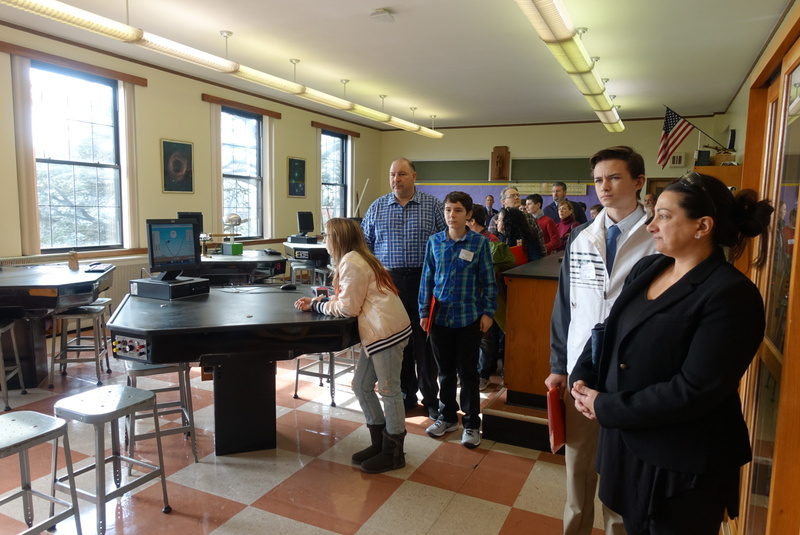 Andrew Corsello, an accepted student who lives in East Williston, said the tour “made me excited to go to Chaminade.” He noted that the speeches were highly informative, and that the students were exceptionally friendly and helpful. The future Flyers tour the physics lab. In October, Chaminade held a more general open house for students who had not yet taken the Catholic High School Entrance Exam (C.H.S.E.E.). This is an informative event, but the open house for accepted students is a more personal and intimate affair. The Glee Club shows off their singing skills at the Open House. Noting that the majority of Chaminade’s teachers attend the open house, Mr. Flood said their presence demonstrates their commitment to the school and its Catholic mission. Posted in News and tagged open house. Bookmark the permalink.